Wichita, get ready for the biggest foodie event this Saturday – Wichita By E.B. Two months ago, I wrote about a decision for my friends and I to enter the Wichita Wagonmasters Downtown Chili Cookoff. It was a long thought out process that my friends and I have discussed over the years and were finally ready to dive in and join the fun. We’ve spent the past couple months cooking and testing different chilis. 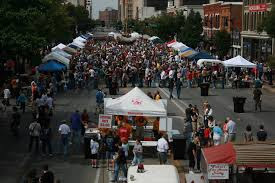 If you don’t know, the Wichita Wagonmasters Downtown Chili Cookoff is the biggest foodie event you will find in town. Teams from all over the midwest come down to Wichita to compete in the event in hopes of becoming the Grand Champion or even earning a spot to compete in the World Championship Chili Cookoff in Reno, NV. Once word went out that we were entering the cookoff, people scrambled to sign up and join the now record amount of 92 entrants all to compete against Wichita By E.B.. OK, I’m totally kidding, it was purely coincidence. The Wichita Wagonmasters actually made the effort to find as many entrants this year and the city responded well. Their average number of cooks is usually in the 70’s and this year, they’ve had to turn teams away. The response was overwhelming. And who benefits from it all? You. Chili fans, people looking for something to do Saturday, and foodies in general are in for a real treat with the record 92 entrants. For $5, attendees will get a tasting kit that allows them to try all the chili they can handle. Beer and water are also sold at the event to make it even better. If that doesn’t intrigue you enough, check out the forecast. It’s scheduled to be in the low 70’s which is perfect chili weather! Tasting kits also include a bean which you can give to the booth you believe has the best chili. The team with the most beans will win the People’s Choice Award. Our team name is “The Chili of the Plains” and my team members have worked extremely hard at putting together a fantastic recipe we hope you like. If you want to come visit our booth and give our chili a try, we will be at the west end of the event on Douglas between Topeka and Emporia. Come say hi, try out chili, give us your honest review and hopefully your bean! Here’s a tip as well from your friendly neighborhood “Chili of the Plains” team, the east entrance can get very busy. There’s parking available near Topeka and William, so if you’re looking for a less busy line enter from the west. You’ll have less of a hassle. Our team will be entering the Anything Goes, No Beans, ICS Red and Salsa category. While we are doing it for fun and just take in another fun event the city has to offer, our goal is to place hopefully in the top three in any category. We also decided that anything we will go towards the Here For Tim Fundraiser. I can’t stress enough how fun this event is. It’s so well organized by the Wichita Wagonmasters and a big food party my friends and I attend every year. If you need more of a reason to go, the proceeds of the event go to support local charities. Eating for charity? SIGN ME UP! If that doesn’t sell you, there’s going to be a flyover of World War II era planes to kick off the event, live music, pepper eating contest (You won’t see me there), a kid zone, and did I mention all you can eat chili? This is our very first time attending the cookoff as actual cooks so we can’t put into words how excited we are. Saturday morning cannot come soon enough! After that, we will blog how everything went in case anybody else decides to join for their first time next year. For more information on this event which takes place on Saturday, September 30 starting at Noon, check out: http://www.wagonmasterschili.com/. There are two entrances this year. The West entrance at Douglas and Topeka or the East entrance at Douglas and St. Francis. You can get your $5 tasting kits at either entrance. Some shout outs. One to Ruse Brown with UBS Financial Services Inc. He was the main person with Wichita Wagonmasters to really talk us into committing and sponsored our team. Ruse is a great guy and if you’re ever looking for some financial services when it comes to planning, investing, lending, or anything, I would definitely recommend you give Ruse a call at 316-612-6513 or visit his website at www.ubs.com/fa/rusebrown. Also Bill Ramsey with Wichita Wagonmasters was also extremely helpful in answering the numerous amounts of questions my team had. And to the Wichita Wagonmasters in general, everything they do for this community is fantastic. I’ll always support any group who has the city’s best interest in mind.